Compass Rose for the Hidden History of Oz. 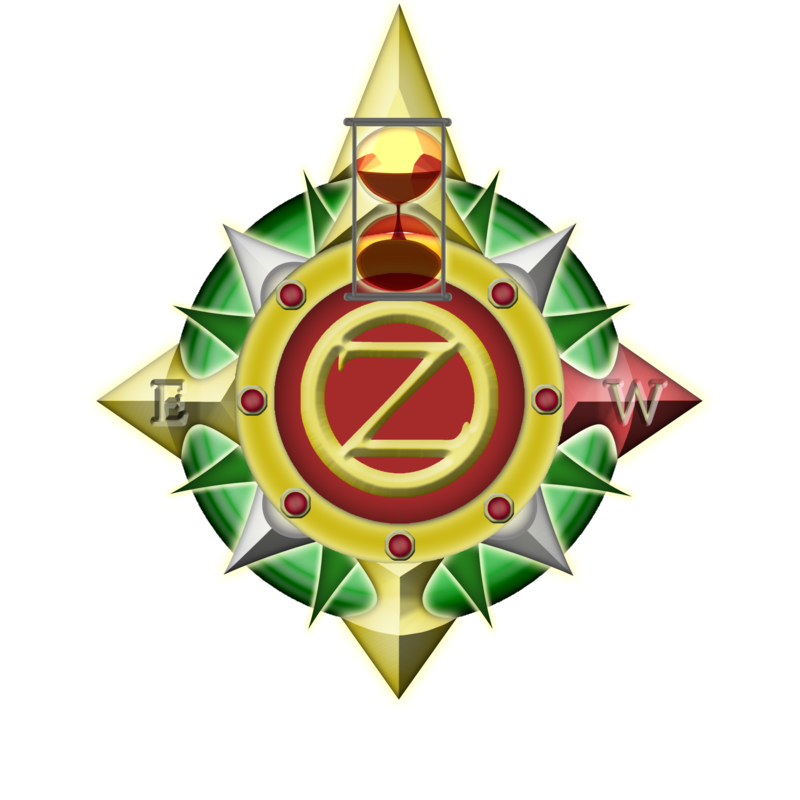 Note that the directions East and West are reversed from the "civilized world"
The compass rose in Oz has been a controversy for more than a century. The directions East and West are reversed on the first “official” map of Oz. Was this a mistake? Or are directions truly different in Oz? Let’s first examine the official explanation for the reversed compass rose and look at the map. Then we’ll look to the books for more information. 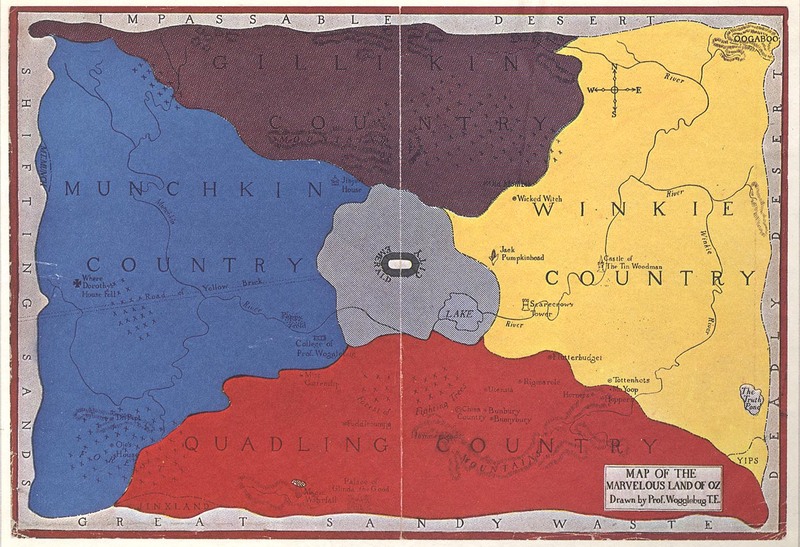 One of the original maps of Oz. Note that the compass rose is "normal", but the map is reversed - the Winkies are supposed to be in the West (here they are in the East). L. Frank Baum made a map on a glass slide that he used with his Fairylogue and Radio-Play traveling show. This map had a traditional compass rose, with the West on the left, and the East on the right. The first book that had a map had those directions reversed, and the compass adjusted to match the map. Oz scholars believe that Baum copied the map from the wrong side of the glass slide. That would make a mirror image of everything. When he realized this mistake, he corrected the compass rose to make it point the “normal” directions. Then an editor at Reilly and Lee (publisher of many Oz books) reversed the compass rose, thinking that he was fixing a mistake. This led to greater confusion. Ruth Plumly Thompson, in her expanded universe Oz books, frequently used the reversed directions as a result of this “official” map. Here is an excellent video overview of all of the official maps that have been associated with canonical Oz. Both the Hidden History stories and The Wonderful Wizard of Oz contain references to the directions in Oz. In The Wonderful Wizard of Oz, Dorothy knew which way she was going. After she melted the Wicked Witch of the West, and they headed back to the Emerald City. Dorothy knew east from west. It was much harder to find their way back through the big fields of buttercups and yellow daisies1 than it was being carried. They knew, of course, they must go straight east, toward the rising sun; and they started off in the right way. But at noon, when the sun was over their heads, they did not know which was east and which was west, and that was the reason they were lost in the great fields. Oscar gathered broken pieces of wood and glass to use for the cardinal points. “If this is a map, then North is up. East is right. South is down. West is left.” He placed everything in position and then stood back very proud of himself. He glanced over to Glinda for approval, and his self-admiration collapsed. Glinda was laughing at him. “No, silly goose.” She shook her head. “East is left. West is right. Haven’t you watched the sun rise and set? What land are you from, anyway?” She giggled. So what are we to deduce from all of this back and forth running? Is right East and left West in Oz? Let me ask you this – does it matter to you? If so, then you can choose which direction you want the sun to rise. In the Hidden History of Oz series, I write the directions as they show on the map – left is East and right is West. This doesn’t change the direction that the sun actually rises in, only the side that the people believe the sun rises. This is very clear in the text. From atop the Grand Tower in Central City, Mombi looked out toward the setting sun. That was where the armies would meet—at the place where the sun set. Ondri-baba’s army had been gone more than a day. If she marched through the night, the armies would meet the following evening. Ultimately, the directions you choose are based on the map you believe in. Follow the story and determine the best map for your travels. For myself, I am left asking the question, why would the people of Oz believe the reversed directions? Who or what in their history changed the compass rose? That compass rose smells like a sweet story to me. That is the kind of question that motivates me in my exploration of the Hidden History of Oz. Land of Oz: East and West – the official explanation of the mistaken compass rose. Fairylogue Map – from Hungry Tiger Press, the number-one publisher of additional Oz titles. This entry was posted on April 14, 2012 by Tarl. It was filed under Baum's Oz meets the Hidden History (comparative mythology) and was tagged with cardinal directions, compass, L. Frank Baum, Oz. There’s no scientific reason for east to be right and west left on a map; that’s just the way we do things in our culture. Perhaps it’s different in Oz. It is a little bit different in Oz, and the reason is lost in time, at least for now.